Provide comfort for the family of DAVID COLE with a meaningful gesture of sympathy. 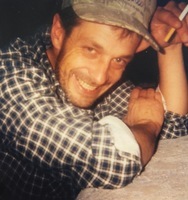 David Charles Cole, 58, former Escanaba resident, passed away early Tuesday morning, April 9, 2019 at his home in Marquette. David was born April 10, 1960 in Escanaba to Charles and Gladys (Rogers) Cole and attended Escanaba schools. He worked as a truck driver for Pryal’s Distributing in Escanaba for several years and also worked as a carpenter. David was a former member of St. Patrick Catholic Church, Escanaba. In his spare time, he enjoyed the outdoors, hunting and fishing. He was an avid sportsfan and enjoyed cheering for the Green Bay Packers. Dave will be greatly missed by his family and friends and will always be remembered for his witty sense of humor and ability to joke around. Surviving are his two sons, Michael and Joseph Cole, both of Escanaba; two daughters, Helyn Cole of Marquette, Stevie Harris and her son Liam Bridges of Negaunee; two brothers, Tony (Dana) Cole of Menominee and Chip (Beth Jennings) Cole of DePere, WI; three sisters: Windy (Roger) Good of Escanaba, Connie (Mark) Ratzmann of Cudahy, WI and Maureen Rogers of Escanaba; brother-in-law, Steven Harris; mother-in-law, Marilyn Koski; his children’s mother, Sharon Cole of Escanaba; and numerous nieces and nephews. A Celebration of David’s Life will be held from 4-7 pm on Friday, April 12th at the USW 2-21 Union Hall, 1201 Sheridan Road in Escanaba. To send flowers in memory of DAVID CHARLES COLE, please visit our Heartfelt Sympathies Store. Provide comfort for the family of DAVID CHARLES COLE by sending flowers. My deepest condolences to David's family and friends. He will be missed by many. So sorry to here about David. He was a beloved friend as a child. RIP David. Heartfelt Sympathies Store purchased flowers for the family of DAVID COLE.